Woah.. how you just said that gave me goose bumps. lol.. Yeah I can see scampering through that forest in a 40 foot tall mech.. Knocking down trees as I walk through it. Hearing the crunch of tree limbs and stuff breaking. Then watching as ZeosPantera comes tracing through on a dino.. Lining up my shot for the kill. Booom! Dino guts everywhere.. lol.. It's incredible, it's hard to believe it's still a WIP!!!!! This engine is only getting better. Dude, this is why its 81600 tris. That looks freaking awesome! Its so cool that you can see each separate leaf. So nice. I can not await to fly through this forest like a Bird. Yeah.. MORE POLY's and better lod management FTW.. These are good trees. Still small compared to a forest of real trees. This is more like an orchard. I'm surprised you haven't gone with procedural pine since that is what they are replacing. Two things I want to see. A video walking or flying over/through a forrest from a natural perspective.. Then a video of a ghost watching a tree from close up going from billboard to 80,000 poly. The bumpy terrain looks really good in context. Oh, and trees are nice as well (although it does look a bit like an orchard, mainly due to the straightness of the trunks). I'm guessing different tree types will also mean different heights? That would really make it look so much more awesome. Could you take the recently discussed terrain-bump algorithm and apply it to the tree surface? Perhaps you could do it only if you're close enough to the tree to notice the difference. It would make the surface look less flat and more organic. 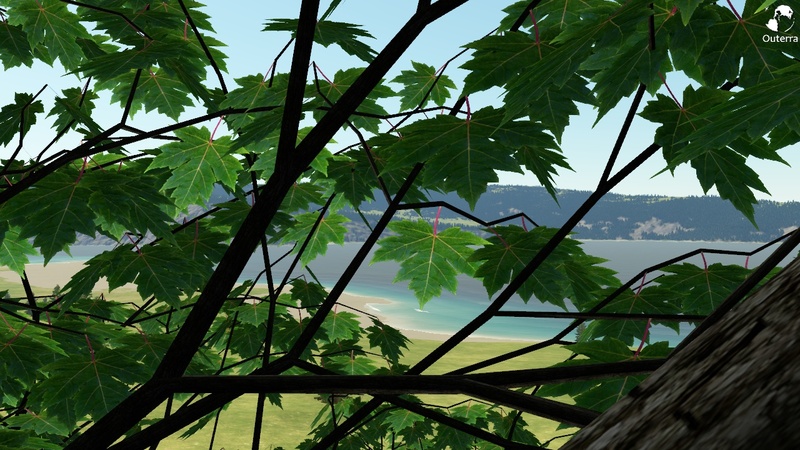 The leaves are a texture with an opacity map, and have nearly nothing to do with the amount of triangles in your model. Yes, adding procedural detail to the surface is planned too. Alright, 3D trees! I've been waiting a long time for this! Can't wait for a video. Hi, i know, it is an old topic, but i were on Youtube, and i found this . The engine is free GPL licence. 3d trees are very good looking, and the sea looks epic. Well i have seen those videos. It is already there in this forum. What i think is really nice about the engine is the ocean rendering. It looks very nice, but one thing which it misses which you can found in OT are the waves. I hope the OT dev. can study their ocean related code and improve their ocean rendering. Any word on 3d trees or rivers? Or biomes? I love flying the mig around with the Rift but I sure can't wait for some prettier scenery to look at and crash in to. Disregard...I was naughty and didn't read the forums first for my answer. Holy smoke!!! I knew my video cards served a higher purpose than 3D gaming! With the link posted earlier http://www.dexsoft-games.com/models/vegetation.html how would we add this to Outerra? If there is a way I'm going to nail a handful of them from that site.